The government was warned that two ships from a third country had unloaded 9,156 tons of North Korean coal in the South, the Foreign Ministry admitted, telling Bareun Future Party lawmaker Choung Byoung-gug, that the suspicions were "reported swiftly" to the government. The Panamanian cargo ship Sky Angel arrived at Incheon port with 4,156 tons of coal and the Sierra Leone-registered Rich Glory at Pohang with 5,000 tons after carrying them from the Russian port of Kholmsk in October last year. The coal was marked as Russian in origin and was imported by a South Korean company, but the ministry suspected that the cargo originated from North Korea and reported it to Foreign Minister Kang Kyung-wha. 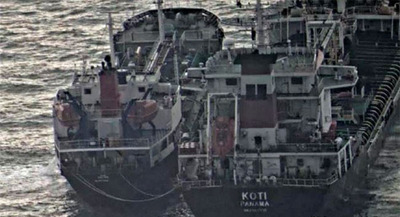 The ships entered South Korean ports some 30 times since unloading the suspicious cargo, but the government did not search them until February this year. The U.S. and the international community have criticized South Korea for being too lax in enforcing sanctions against the North amid a sudden thaw. The U.S. State Department warned that South Korea was potentially violating international regulations. But Kang reportedly told a closed-door briefing at the UN Security Council last Friday that sanctions should be waived in areas necessary for dialogue and cooperation with North Korea. In a meeting with U.S. Secretary of State Mike Pompeo, Kang sought cooperation from the U.S. to live up to the agreement reached at the inter-Korean summit on April 27. A high-ranking government official here said, "We asked for exemptions within the framework of sanctions to continue dialogue and cooperation with the North." The latest incident has further stoked concerns that international sanctions against North Korea are unraveling. The South Korean government has obtained seven temporary exemptions from the U.S. or UN from international sanctions to pursue inter-Korean projects, including the joint training of skiers from the two Koreas in North Korea's Masikryong Ski Resort in January and February of this year. More recently it obtained permission from the UNSC to temporarily lift sanctions in order to set up a military hotline with North Korea. It is currently negotiating exemptions to refurbish a liaison office in the shuttered Kaesong Industrial Complex and a reunion center in the North's Mt. Kumgang resort. China and Russia, which are standing members of the UNSC, have already called for sanctions to be eased. Russian President Vladimir Putin ordered the extension of work visas for North Korean laborers until December of next year, allowing some 3,200 North Korean slave laborers in Russia to stay. The extension of work visas was banned under UNSC Resolution 2375 in September last year. Last month, China and Russia drafted a press release seeking the easing of sanctions against the North, but the document was not distributed due to fierce opposition from the U.S.
At the UN meeting last Friday, U.S. Ambassador to the UN Nikki Haley slammed "some friends who want to go around the rules," especially Russia and China for blocking the sanctions committee from demanding a halt to shipment of petroleum products to North Korea.